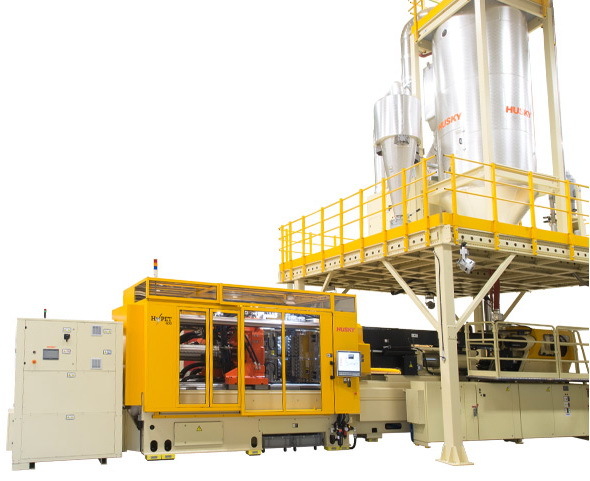 BOLTON, Ontario – Husky Injection Molding Systems today announced the launch of its next generation HyPET® HPP5 preform molding system. Building upon the proven technology of the HyPET® platform, enhancements have been made to HyPET® HPP5 that make it even more capable of delivering the lowest total cost to produce while providing exceptional preform quality. These enhancements allow for up to 12% productivity improvement over the previous generation system and are complemented by all new levels of production flexibility, tooling compatibility and the industry’s first integrated solution for extended mold life. Designed to satisfy the needs of customers with a large installed base of tooling, HyPET® HPP5 offers customers the ability to utilize molds from previous generation products. Simplified cross-generation mold compatibility packages make upgrading equipment easier and help to preserve valuable floor space, while allowing customers to manufacture a complete product range. In addition, a combination of technical solutions offer enhanced production flexibility, which makes the replacement of legacy assets more viable. A key enhancement to the HyPET® HPP5 system is the addition of the industry’s first integrated solution for extended mold life, which helps to significantly improve performance and reduce maintenance costs. Benefits include a 60% increase between required mold maintenance intervals and extended tool life up to 10 million cycles without excessive wear or flash. Sensors ensure correct mold installation and detect misalignment between mold halves during operation. If misalignment is detected, sensors signal the operator through the Polaris™ HMI and provide specific instructions to correct misalignment, allowing the vertical position of the cold half to be adjusted and the mold aligned without the use of a crane. Additional features to reduce maintenance and machine downtime include an improved procedure to align neck rings to the cavity plate and specialized anti-wear coatings that extend greasing intervals up to 120,000 cycles. The CoolPik® dehumidification unit, standard on HyPET® HPP5 systems, has also been improved by replacing the desiccant wheel dehumidification and air to water heat exchanger with refrigerator combined cooling and dehumidification. The HyPET® HPP5 offers air cooling and dehumidification efficiency improvements that can yield a more than 20% reduction in energy consumption. For carbonated soft drink preform applications, when combined with better melt control and other advantages, a cycle time improvement of up to 3% can be achieved. The latest HyPET® HPP5 is much more sophisticated, with software and hardware that have been designed to work together seamlessly. The system has undergone considerable improvements to streamline operation, including upgrades to increase automation and simplify controls. The Polaris™ HMI has been redesigned with a 19-inch full color LCD display, more intuitive layout for easier access to screens, and the ability to monitor and control auxiliaries. Operating software and menu screens have also been enhanced to simplify start-up and logic has been provided to act on the auxiliary feedback and alarms during operation. The Altanium™ temperature controller is now also fully integrated and can be controlled using the Polaris™ HMI. Further simplifying start-up and improving ease of use is Husky’s patented intelligent Mold ID technology, which provides information on mold maintenance, process set-up and operation for each start-up.